Founded by graffiti icon RISK in partnership with Kevin Zinger and Ivory Daniel of The Regime Management as well as local entrepreneurs and philanthropists Howard and Bryan Spunt, Buckshot Gallery is the newest addition to Los Angeles’ thriving art scene. 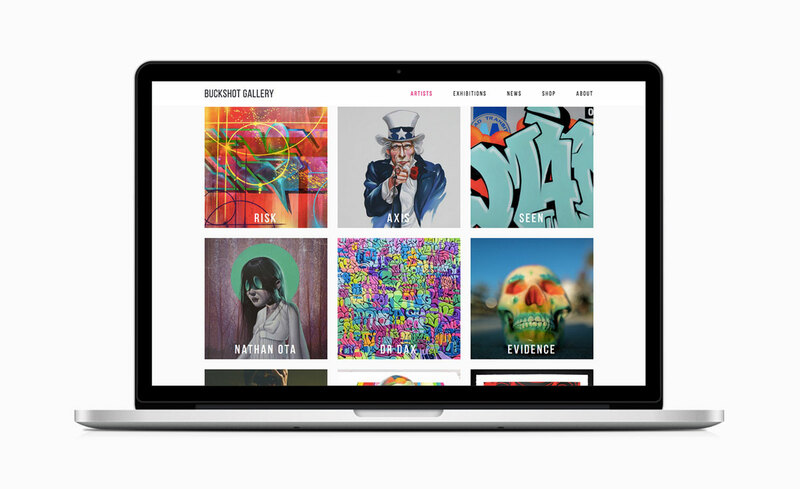 Since its inception, the gallery has created a platform for cutting edge international street art, giving exposure to world class graffiti artists and developing a base of savvy collectors. Interdisciplinary mixing looms large in Buckshot’s programs and in the work of its represented artists, as many come from prolific, well known crews such as MSK, WCA and 7th letter; Art exhibits, music, fashion pop-ups and publications all live under one roof, defining a new wave of creative collaboration. Buckshot Gallery features a balanced blend of fine art and photography. Dedicated to exhibitions that challenge conventional modes of art production and presentation, Buckshot Gallery is committed to contemporary art through a distinguished exhibition program of Los Angeles based and international graffiti artists. In addition to the physical space which is located in Santa Monica California, Buckshot Gallery is an online destination for original art and limited edition prints.